During a diabetes themed episode of Sunday Night this week, I noticed several tweets from Diabetes NSW that had been carefully planted into the #SN7 feed on Twitter (the program’s hashtag). Including this one, which sought to tell us that 7,750 people die from diabetes and related complications each year. 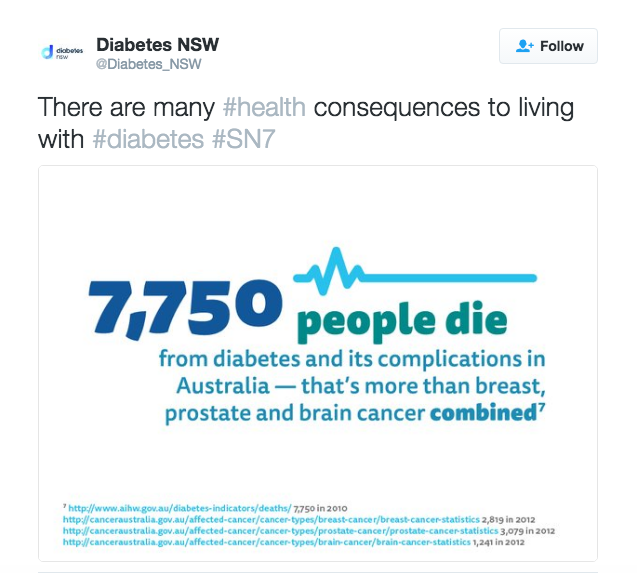 It’s not the first time I’ve seen these kind of Tweets from Diabetes NSW as of late. During the diabetes community’s I Wish People Knew That Diabetes day last month, Diabetes NSW once again hijacked the feed to fill us in on some of the scary facts. On both occasions, the Tweets appeared automated and displayed little understanding around the respective hashtags they were hijacking. After seeing this tactic employed once again on Sunday evening, I couldn’t help but call them out. As a member based organisation that supposedly represents and supports people with diabetes, messages like these really do members a disservice. Do messages promoting complications and instilling fear around poorly managed diabetes really motivate individuals to look after their health? I think not. And judging by the reaction I received on Twitter, I am not the only person who feels this way. While stories like these may be effective on people without diabetes, I feel that they sorely overlook those of us who already live with it. In my opinion, health consequences such as obesity, sugar consumption, physical activity or kidney failure are separate issues that need to be dealt with exclusively from diabetes. The sad reality is that the wider media eat up the sensationalised stories around the complications and fear surrounding life with diabetes. People without any connection to diabetes make assumptions based on what they see reported. Perhaps that a person with diabetes is not fit to work. That a person with diabetes lives an unhealthy lifestyle. Or in the case of the aforementioned Tweet, that a person with diabetes could drop dead at any given moment! Yet the positive stories, the ones around people with diabetes being able to live healthy and full lives are often overlooked, or overshadowed by the sensationalised stories. 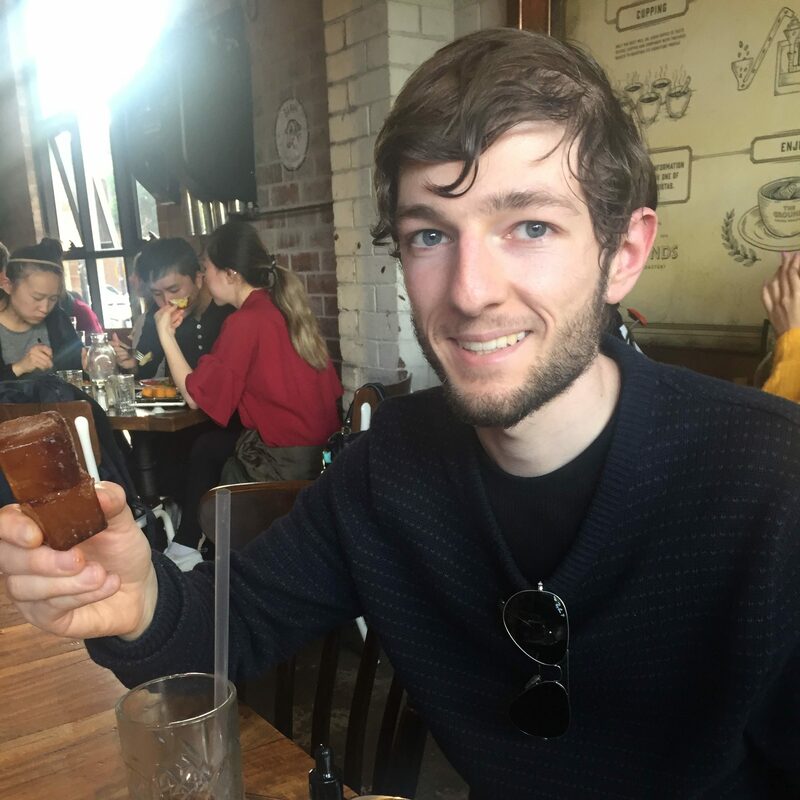 Diabetes NSW were quick to point me to a page of positive “ambassador” stories on their website, including another “Frank” who I reminded them of. Yet I am reminded of this recent post from Melinda at Twice Diabetes. I can’t help but wonder whether they are ambassadors who are truly engaged with the organisation and the community, or just figureheads that are referenced when necessary. 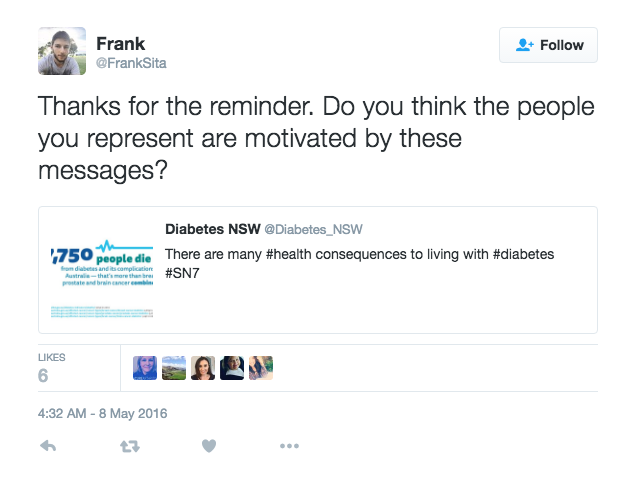 To be fair, Diabetes NSW is not the first organisation to instill these messages. We had the dreadful 280 a Day campaign for Diabetes Week last year in Australia, and more recently we had the very confusing World Health Day. Shaping the conversation around diabetes in public begins with the organisations who represent us. I only wish we weren’t so hard done by all the time. Diabetes NSW whom are funded by Diabetes Australia and many affiliations are all to blame for this line of media attack on diabetics whom suffer from the distressing complications of diabetes. I and others have written to both on such subjects and are either ignored, responded to with false justifications and or blocked from their media sites. Whilst their toadies are blogs are bolstered on their so called professional sites. It is time Diabetes NSW’s whom i consider in collusion with Diabetes Australia faced a parliamentary enquiry and investigation. This line of scare mongering towards diabetics has to STOP. Rather then giving advocacy and support to the diabetes community these corporate mongrels are doing nothing but rake in the $$$ for their own executive pockets. Yet when independent community groups do raise petitions or pose the questions, the diabetes community seem very quiet on the issue. The diabetes community need to have the intestinal fortitude to support those who take the time to oppose what is clearly wrong in the “diabetes industry” or as has happened accept the cuts, non existent DA advocacy and all the propaganda that goes with it. If the diabetes community as a collective whole are not prepared to stand up and be counted in not only preserving our rights but bringing back what we have lost because of these corporate mongrels then so be it. Currently i am undertaking a submission to Parliament to ask for a Federal enquiry into the corruption within DA and it’s affiliations, without submissions from every day people living with diabetes to back my submission up it is doubtful this will produce the results needed to get a investigation into DA and it’s affiliations as to what they have been doing over the last decade with the billions of federal dollars they are allocated, apart from guilt promoting propaganda, scare mongering, giving out research grants to some of the most diabetes removed causes, funding ranting idiot bloggers, bolstering their toadies and giving the notorious gutter mongrels Diabetes NSW right of way to taint, distress. burden and stigmatise diabetics. Unless the millions of diabetics in Australia start to USE the voice they have then nothing will change oh apart form each and every one of us paying more and more for our supplies. watch everyone ran out and buy a Libra flash metre, with no subsidy, hoorah to the Federal Government and DA, because with everyone self funding the Libra, you guessed it the cost saving on blood test strips will be astronomical. And with DA and D NSW fuelling the scare mongering propaganda next we will be told we are irresponsible for not choosing the Libra, hmm corporate money, under the table money etc……………….. Think again if you think Diabetes NSW is working alone, take a close hard look at Diabetes Australia! I admire your courage and resolve Frank, if only half the diabetes community got on board we would be on our way to some real advocacy, support and positive future change for diabetics. For years now the diabetes community keep telling the National bodies we want the burden of this disease to be lifted by the subsidy of newer technologies, it is simple, reduce the burden and you have less burnout, less depression, better control. Yet no one listens, instead we hear propaganda that we should have more CDE’s, more counselling, well quite frankly give diabetics CGM subsidised and all insulin users pumps and see how the depression and burnout automatically resolve. Thanks for the discussion on Twitter on Sunday Night, gaining insights and ideas from people as passionate as yourself is valuable, and powerful. As you and I discussed on Sunday, Diabetes NSW believe in the power of positive stories and agree that it can’t, and shouldn’t be, just stats that health orgs talk about. As we also mentioned, we’re actually taking inspiration from the #iwishthatdiabetes campaign for some of our Diabetes Week activity, so we’ll be sharing positive messages and stories, along with some harder facts. As you mention, the facts are often aimed at those at risk or undiagnosed, while positive stories, like those of our Ambassadors, are better for those living with diabetes, like yourself. As I’m sure you would understand, there are many theories, and studies into, human psychology and the different types of behaviours and messages that motivate different types of people. We know from these studies that different people respond to different types of messages. Some respond to positive messages (towards motivation), others to negative (away from motivation), and often a combination of the two is an effective approach. We note the point made by yourself, and others, that some – like children – may not respond well to statistics and negativity, and we agree – but we know that others do, while not responding to the softer approach of stories and positive messaging. This is why we use a combination of mortality messaging, statistics and positive stories to drive awareness about diabetes prevention, management, and care – to appeal to people’s different motivational and communication preferences. We’re always happy to discuss this, and other work we do to advocate for those living with or at risk of with Diabetes, further. Thank you for advocating for the those living with diabetes, it’s a worthy cause that deserves much attention. Thanks for this post Frank. I intend to blog on this point as well. There is solid evidence that “scare tactics” harm certain groups of people, either DNSW are ignoring this research or don’t know it exists OR are quite happy to harm people with diabetes in order to possibly prevent some people getting diabetes. Either way, I think people with diabetes are being done a disservice by the very organisation that is supposed to represent their interests. Thanks Melinda, and thanks for coming to my defence the other night. I’ll see you in Sydney. Great post Frank! I can come in on this not as a PWD but as a mother of a 15 year old boy who has type1 diabetes. I would love to encourage my son to use social media and find the support that is undoubtedly there but when I see these tweets, I’m glad he doesn’t. Also as someone who loves a PWD, these tweets quite simply make me sad. I’ve met parents of little kids with diabetes who are well and truly ‘in the trenches’. They live and breathe this disease with their little children. How could this message ever help them? The children and teenagers I know with diabetes work damn hard to be healthy and face great challenges to do so. They need to see posters and Facebook postings which are positive. Whilst I acknowledge that there are heart warming success stories out there that serve as inspiration to many, most people only see the headlines or hear the sound bites. We need short, sharp, positive messages as well the longer stories. It’s great to see that Diabetes NSW are entering into a dialogue. Let’s see what they can produce in the future to show that they really are listening.